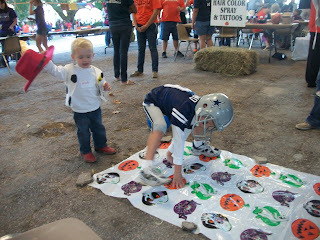 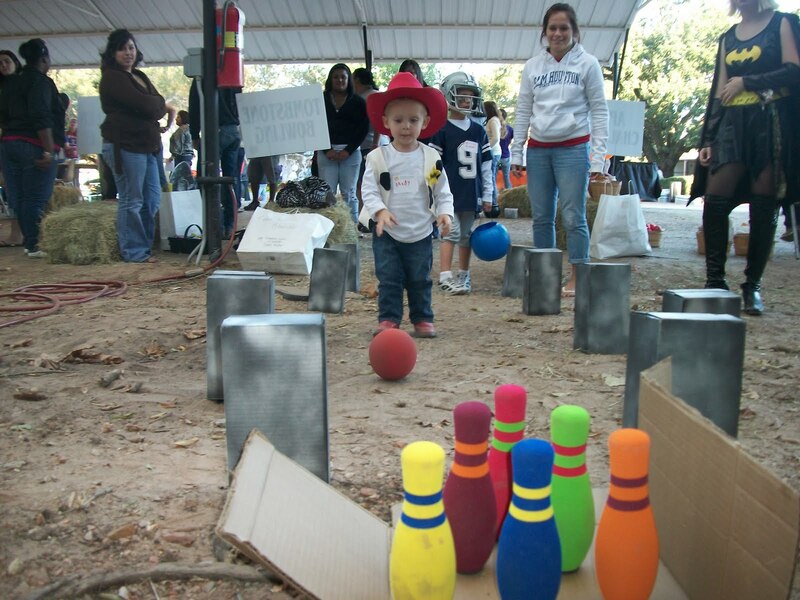 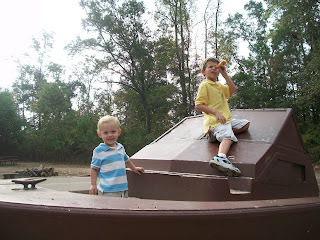 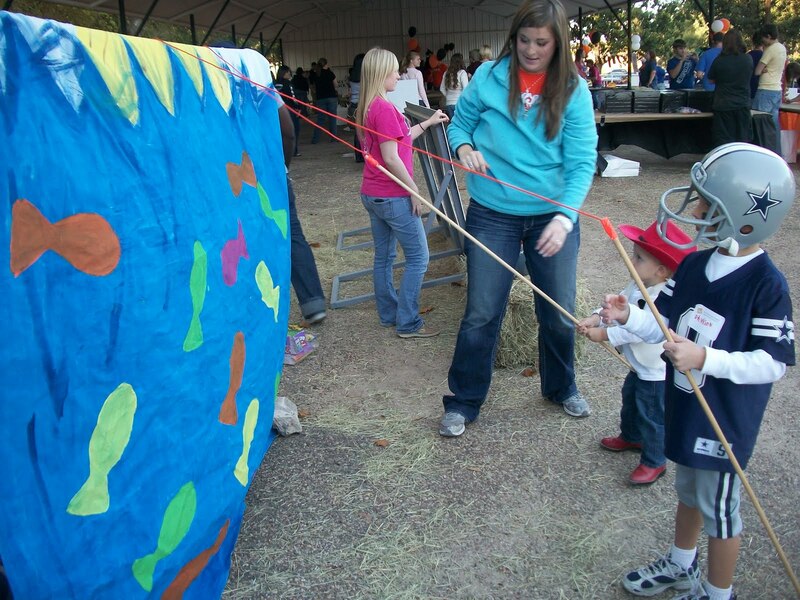 I took the boys to the university fall festival, where they enjoyed playing tons of games, crafts, food, inflatable jumper, hayride, and a costume parade. 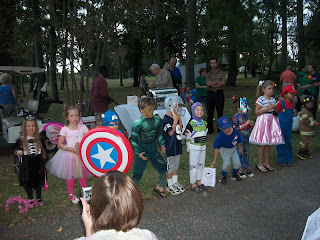 It was a wonderful evening!! Taking a break from the games to enjoy a cupcake. 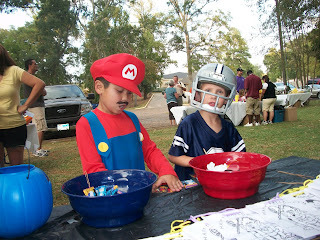 I think it's hilarious how Dawson managed to eat his cupcake with his helmet still on. 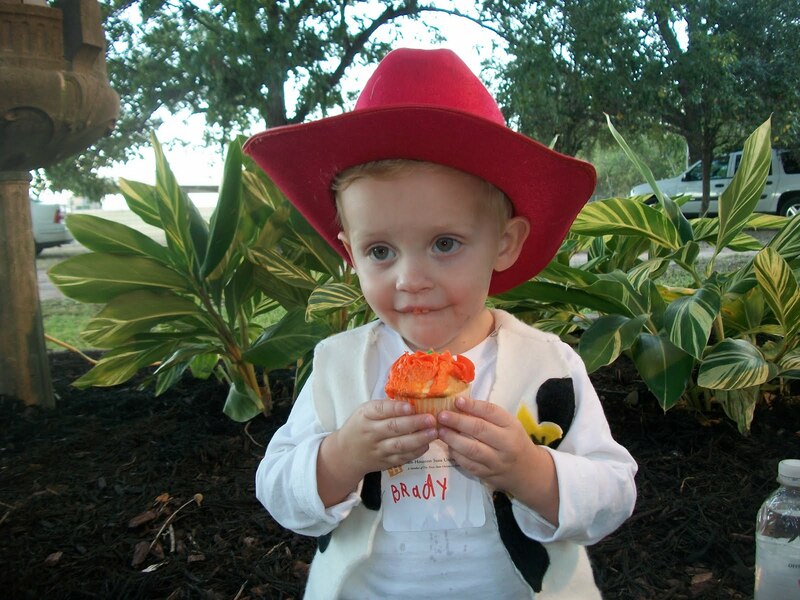 Brady loving the orange icing on the cupcake. What a cutie! The university festival included a costume parade, in which every child in costume had the chance to walk across the stage and tell everyone what they were in the microphone. 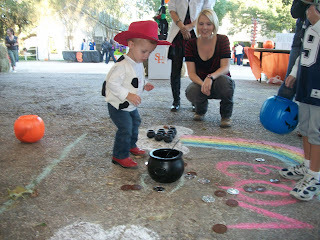 And they all got a little necklace as a prize. 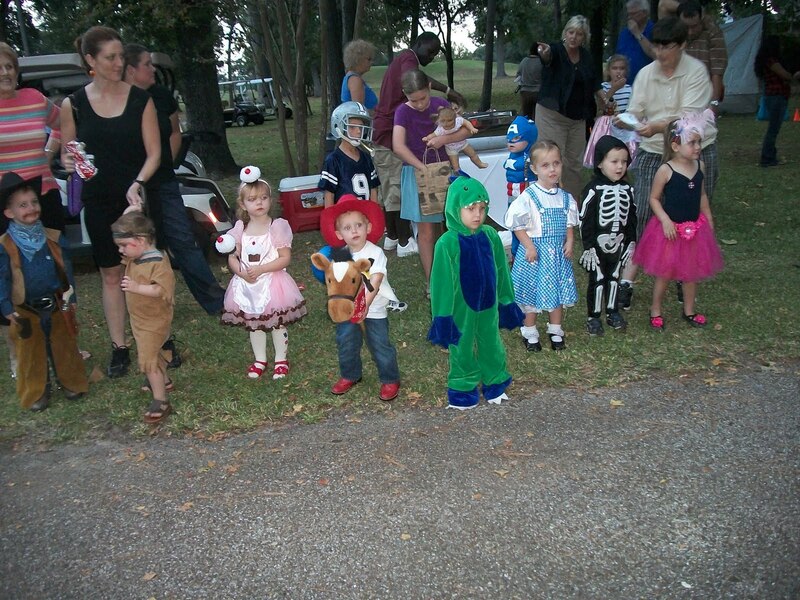 They were all so cute!!! 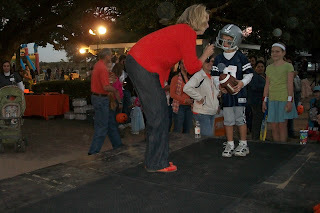 Brady on stage. 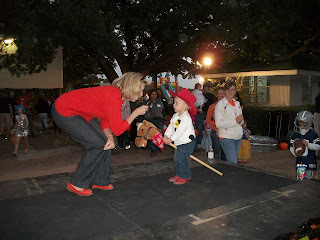 He put his mouth to the microphone but didn't utter a word! 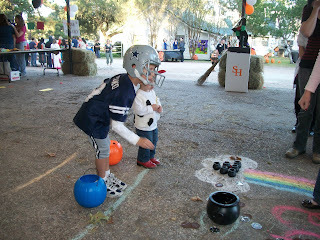 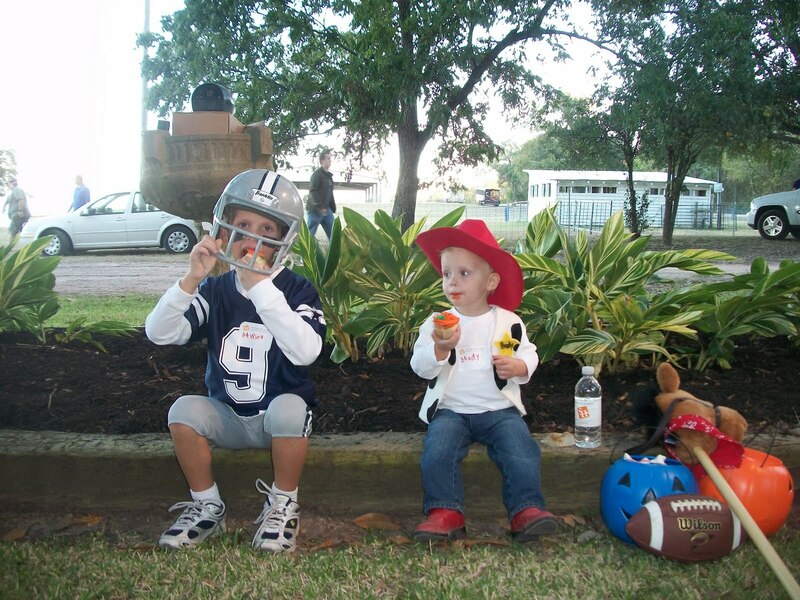 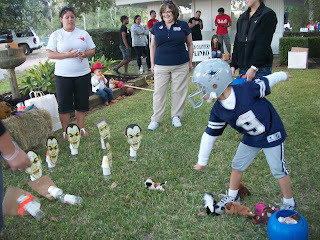 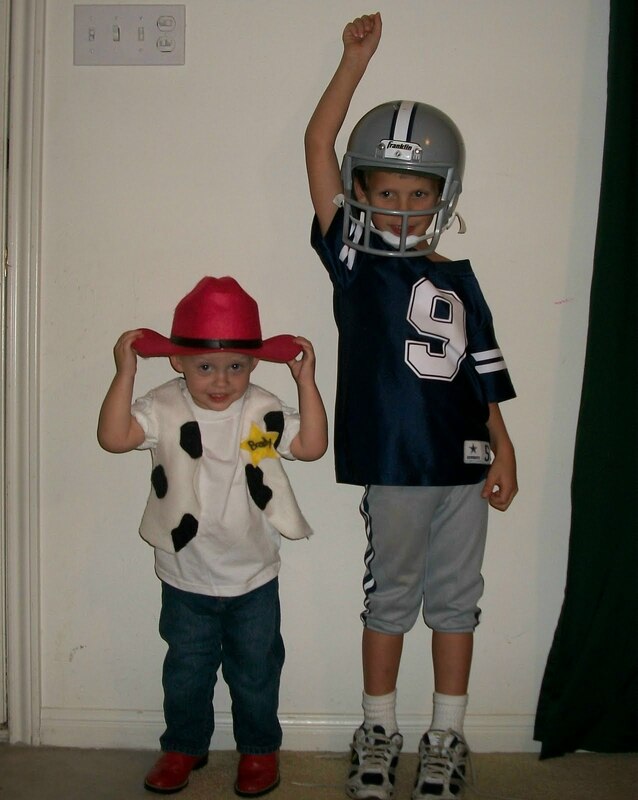 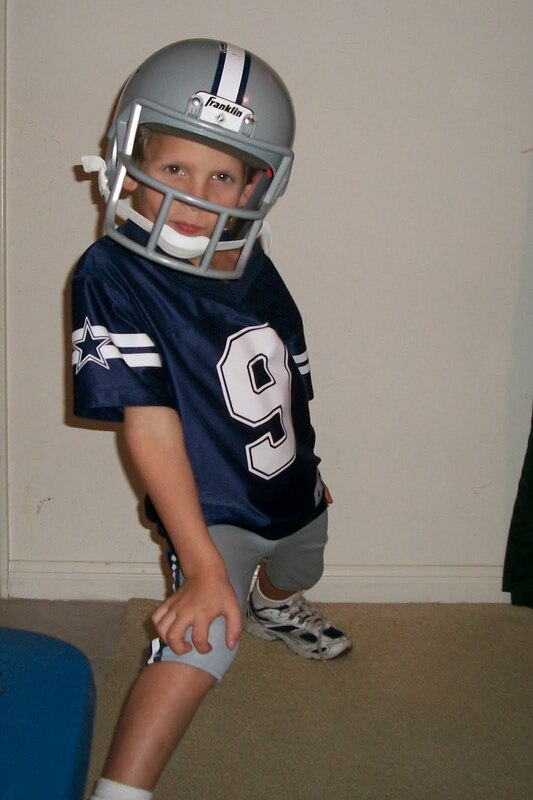 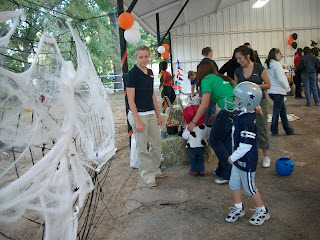 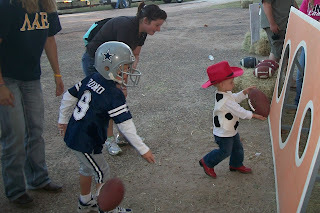 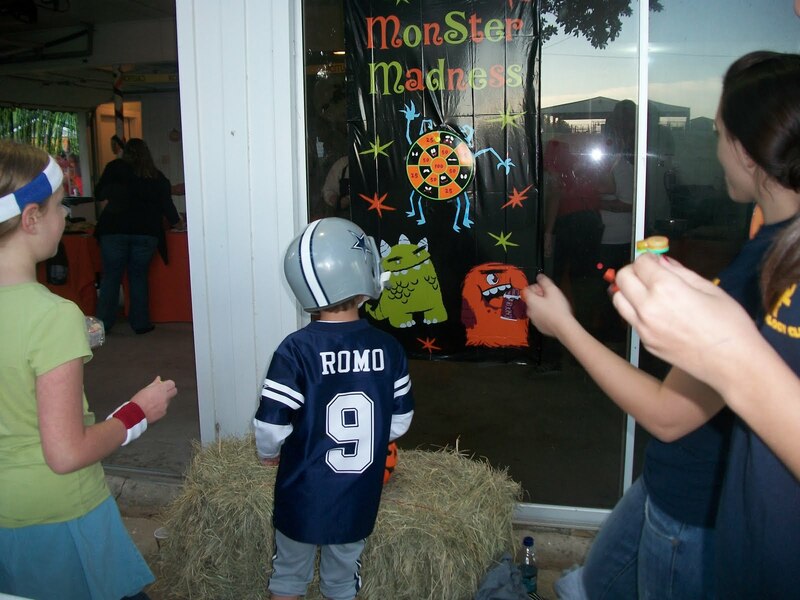 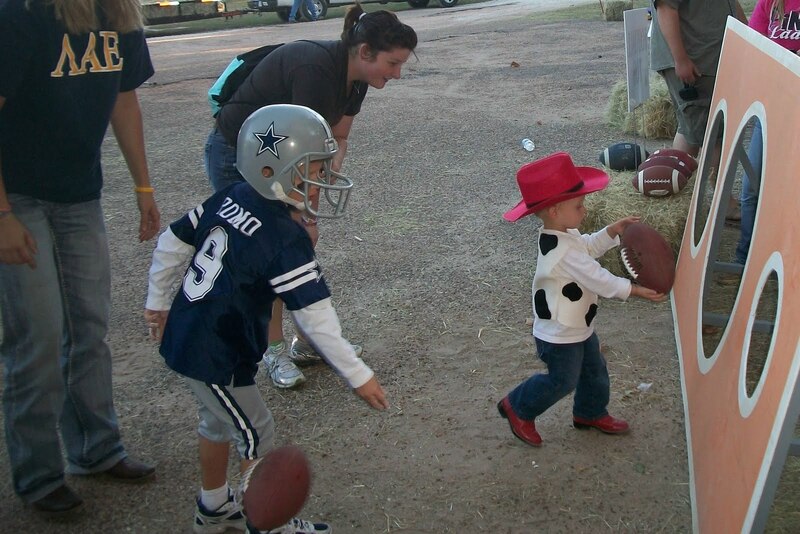 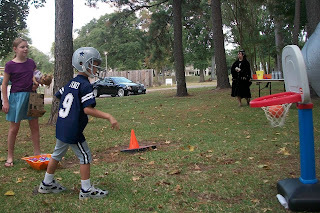 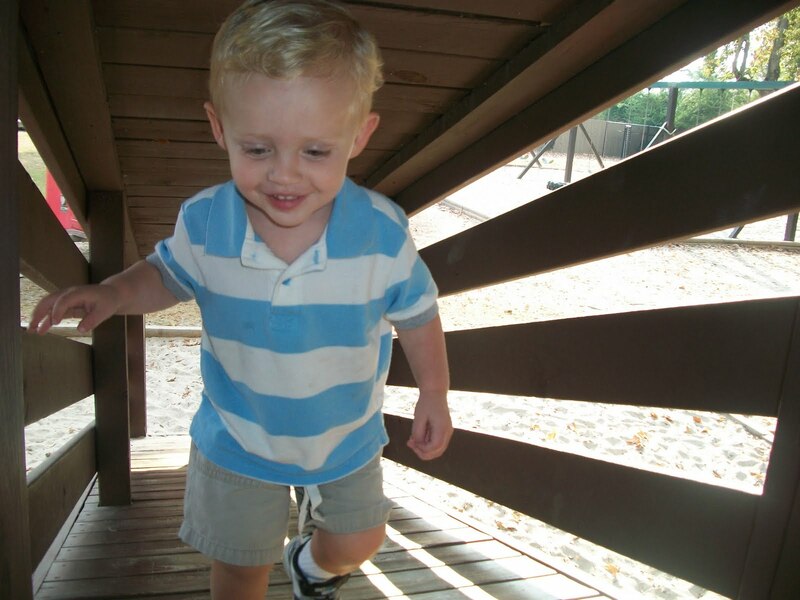 Sweet adorable Dawson telling everyone that he was Tony Romo!! 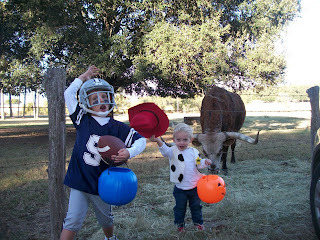 Our cowboys showing off their moves in front of the longhorn at Gibbs Ranch. Dawson is doing some sort of football move or cheer and Brady is saying "yee-haw." 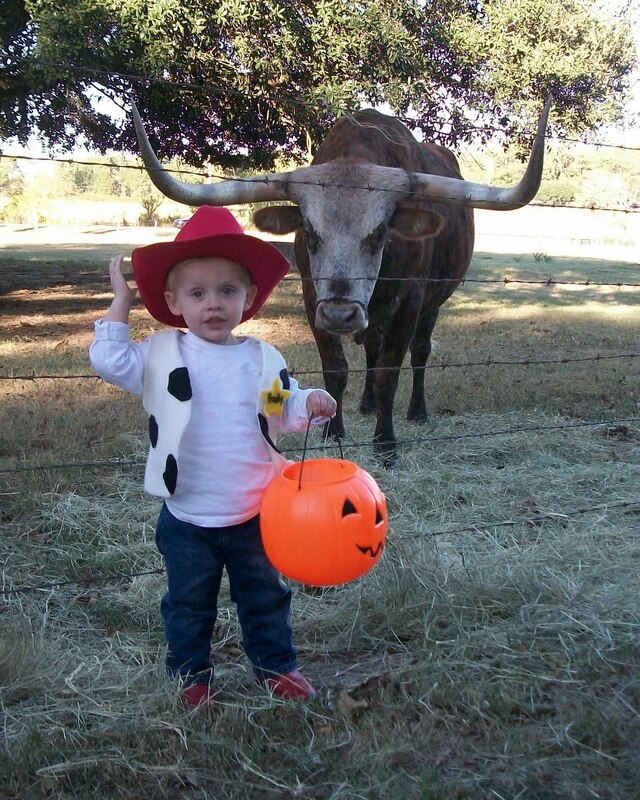 A cowboy and a big giant cow. 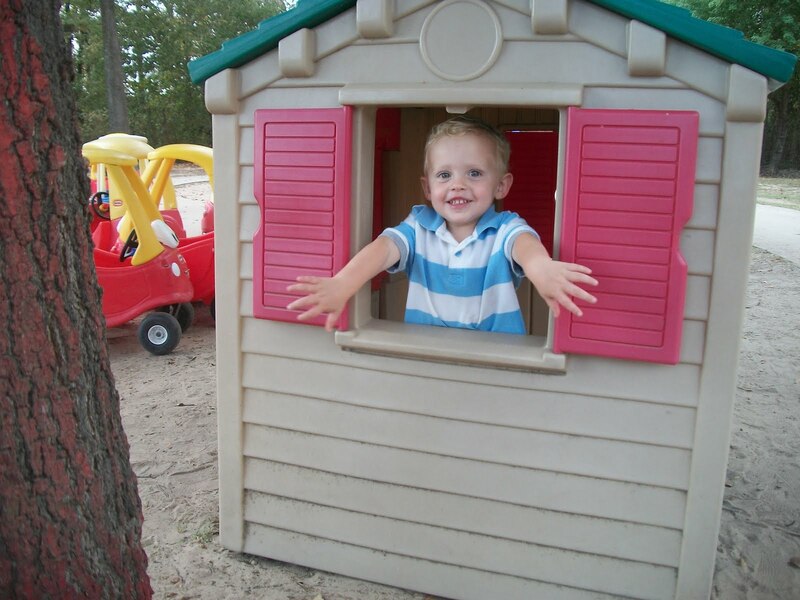 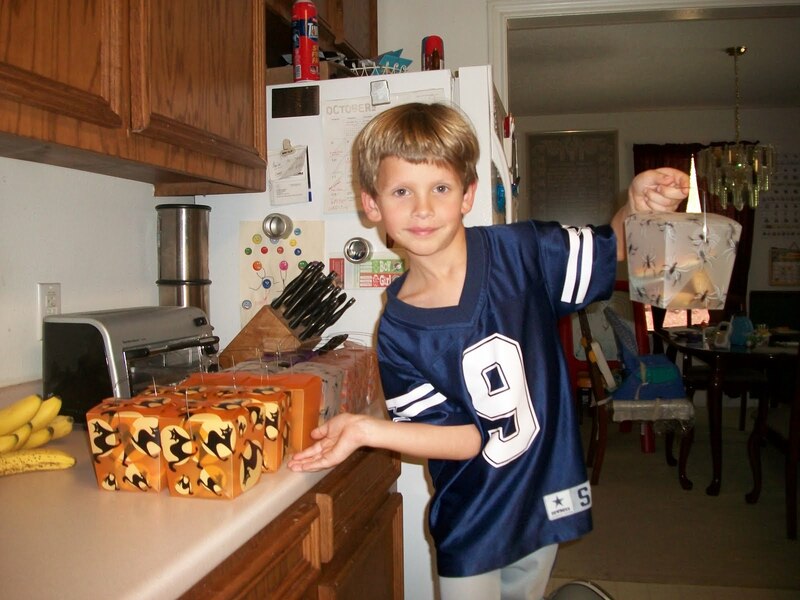 Dawson showing off the cute Halloween boxes filled with homemade cookies that he made and delivered to his friends. 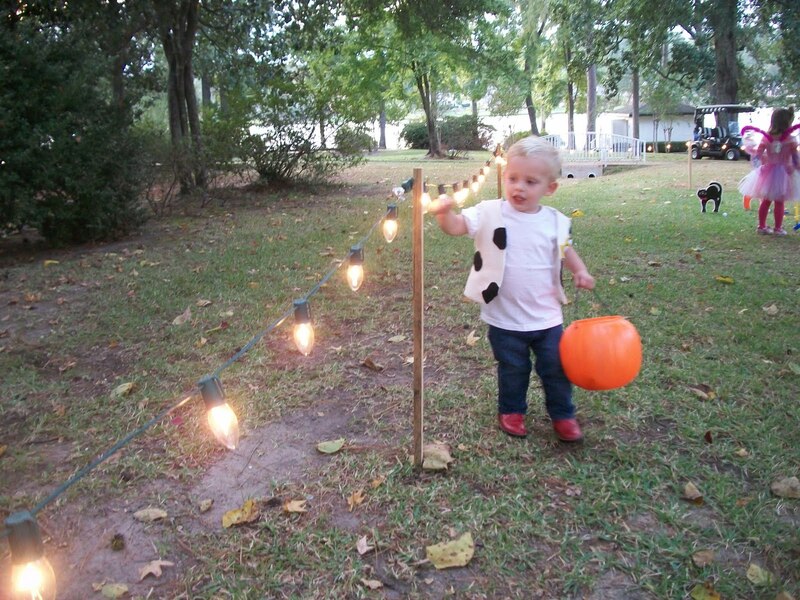 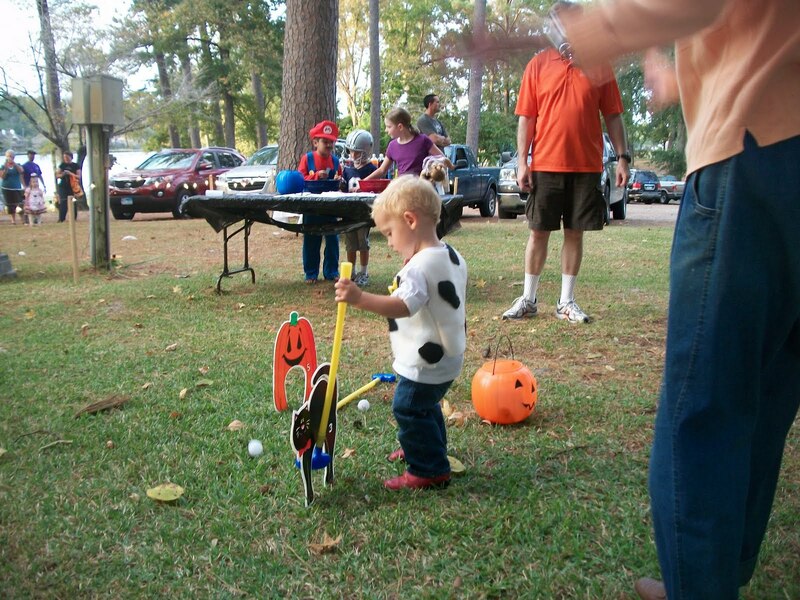 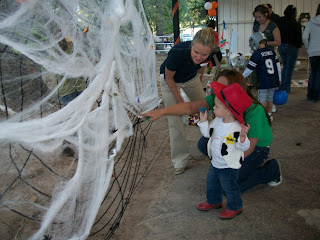 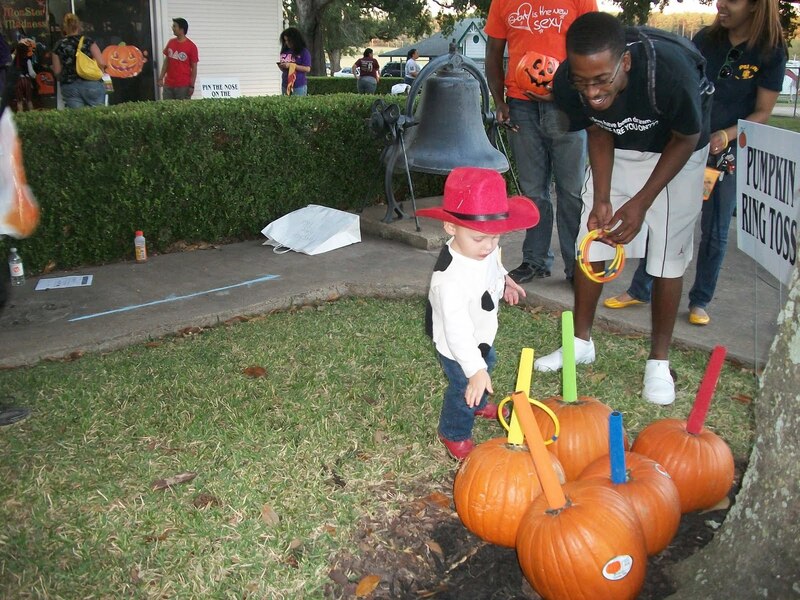 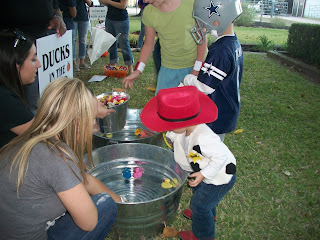 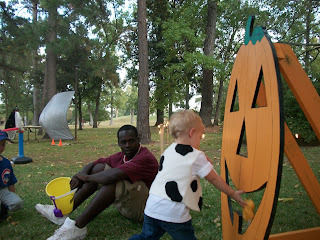 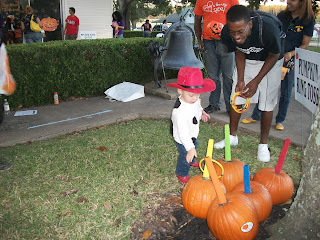 We attended our first Halloween festival of the month - our little neighborhood gathering. 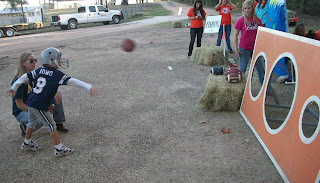 It was small, but still fun. 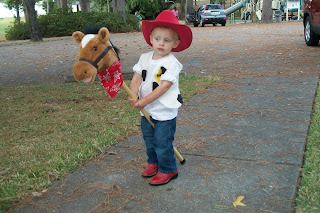 Brady and his horse are ready to go! 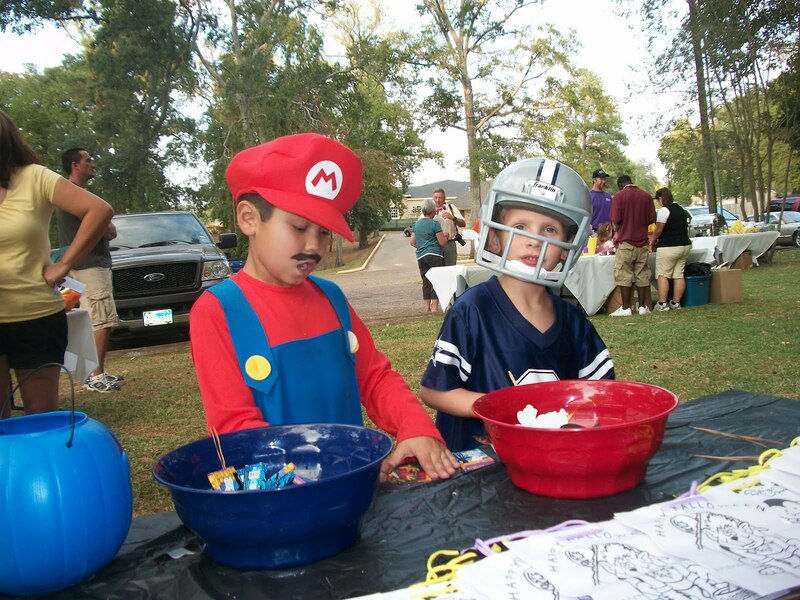 Romo and Mario working on a craft. Football isn't the only thing Romo is good at - he can play basketball too!! 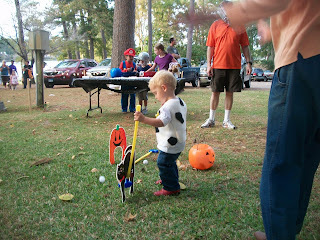 I know it's a very short hoop, but Dawson was still great! 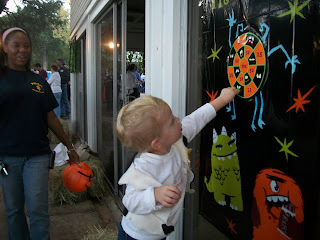 Instead of tossing the bean bags, Brady went right up to the pumpkin and put them through the holes. 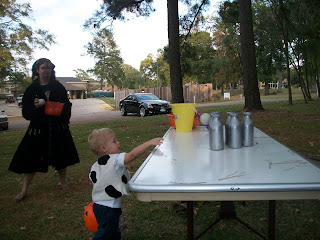 He still thought it was fun! 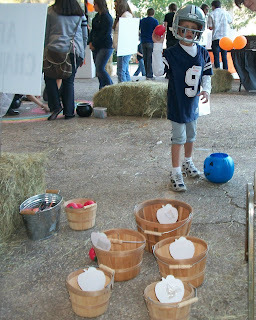 Brady trying the ball toss game - more of a ball rolling game for him. Brady was walking by the lights and touching each one as he said his ABC's. 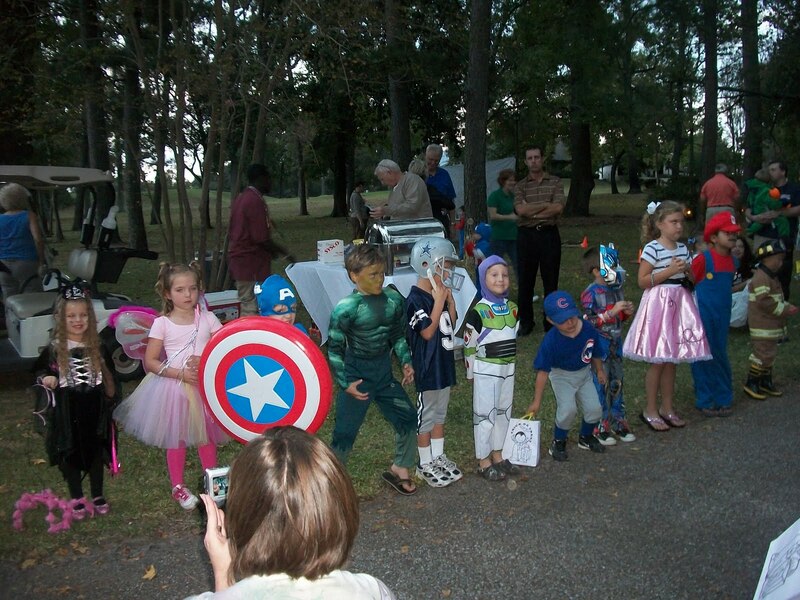 The bigger kids lined up for the costume judging. 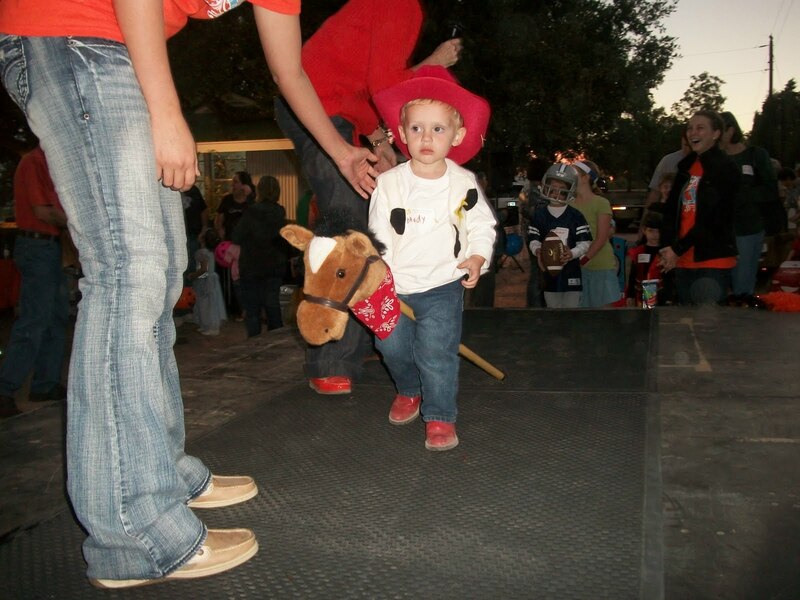 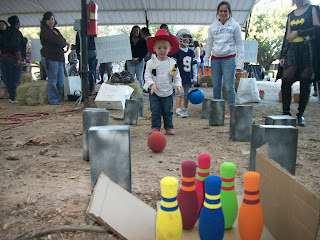 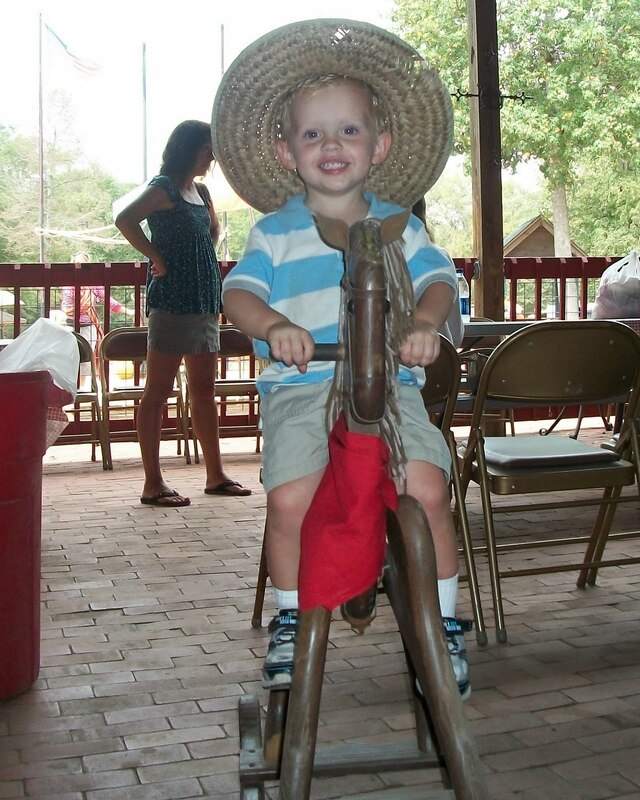 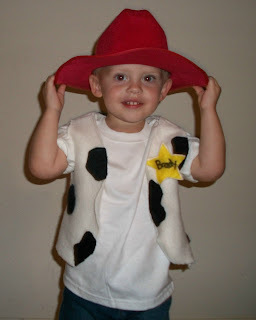 Again, our cowboy didn't win, but we thought he looked very cute! 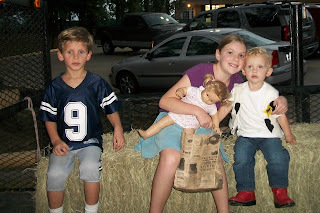 Dawson, Sarah, and Brady ready for the hayride. 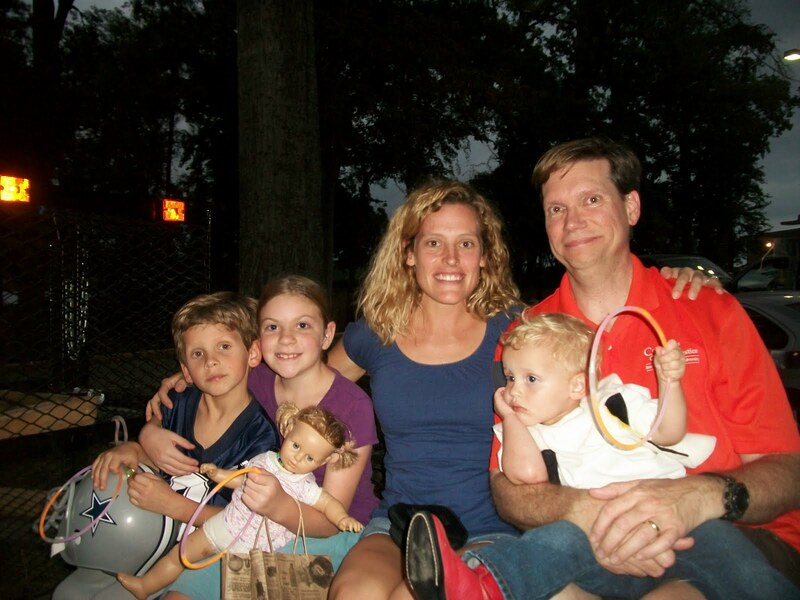 Family picture on the hayride. 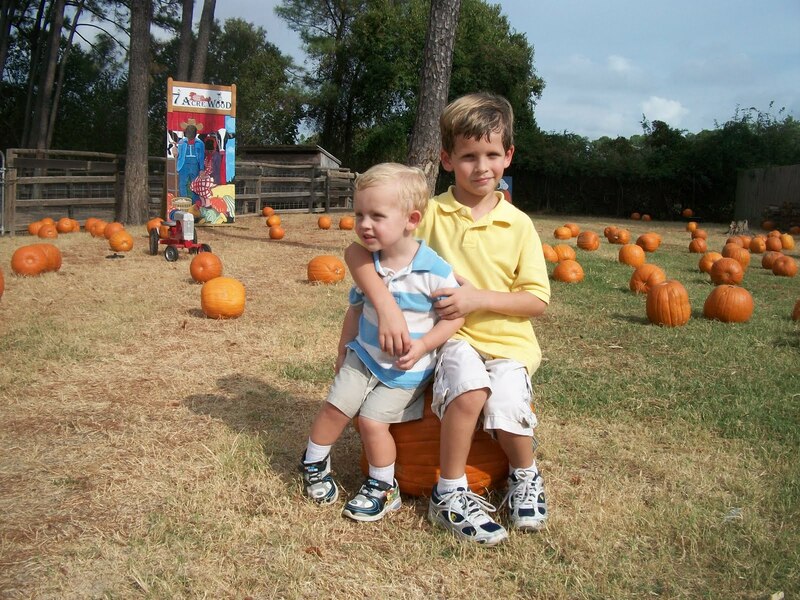 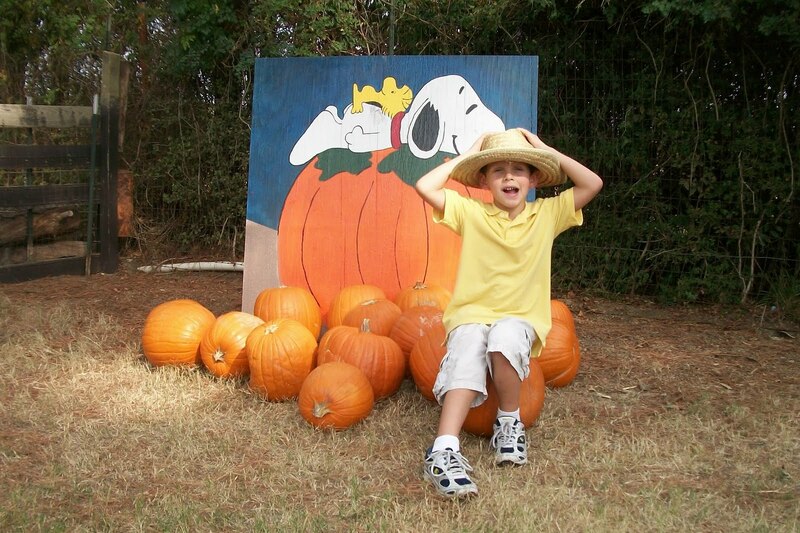 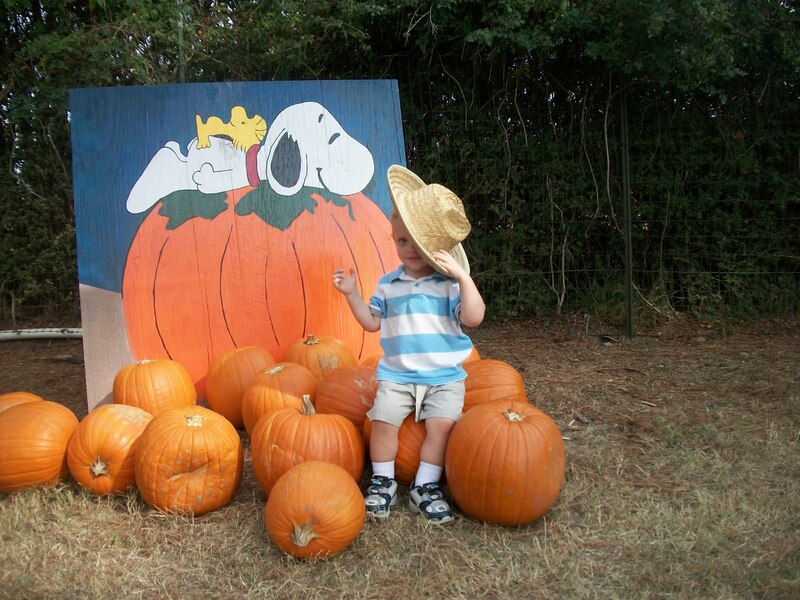 I was really looking forward to taking some amazing pictures of the boys in the pumpkin patch at 7 Acre Wood. 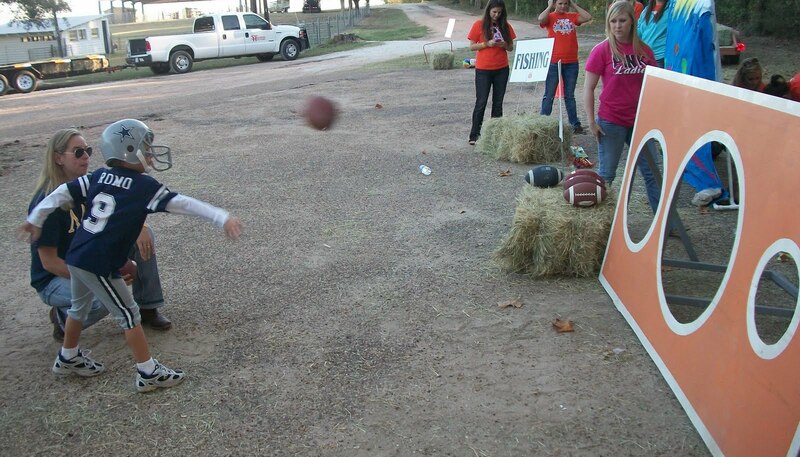 Unfortunately it just didn't work out. 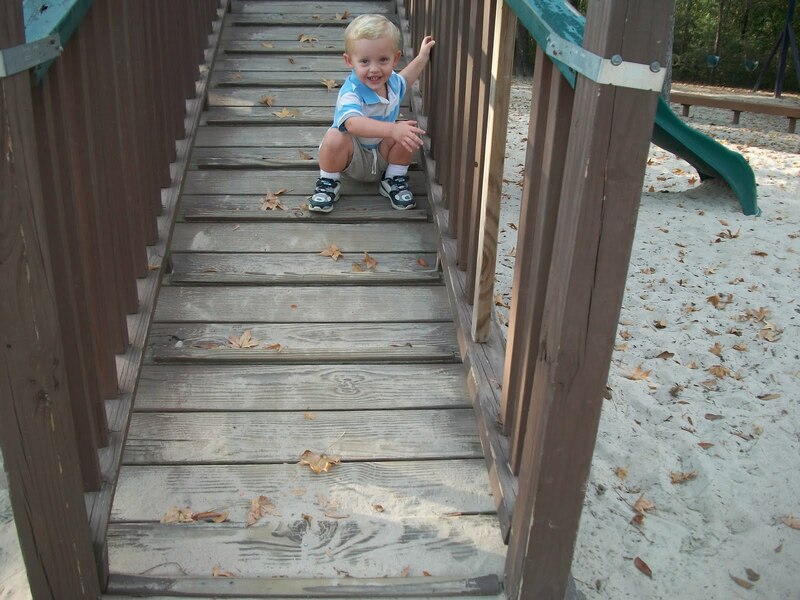 Brady isn't very willing to sit down, look at the camera, and smile. And we didn't stop by the pumpkin patch until the end of our trip so they were both hot and sweaty and tired. But here's what I did get. 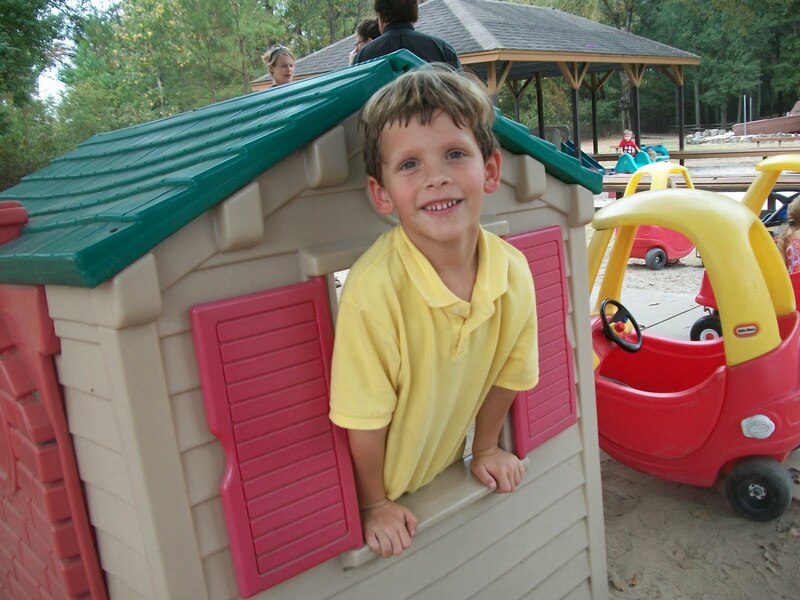 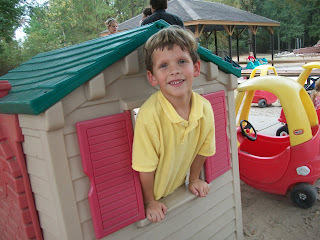 There are lots of fun play areas at 7 Acre Wood and we visited them all! 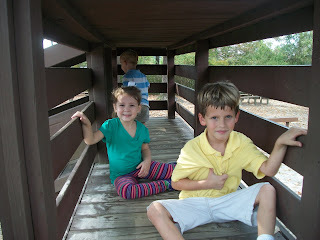 Hannah and Dawson playing on the big wooden fort. 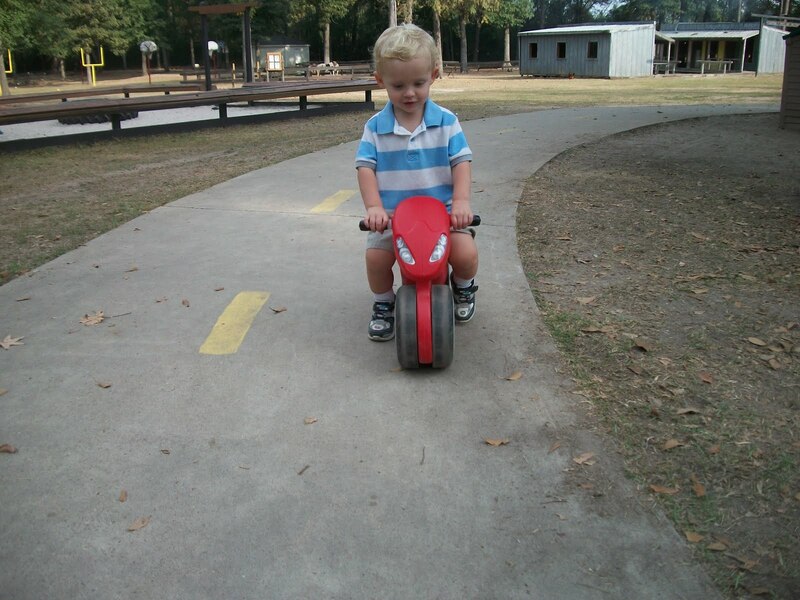 Brady coming up one of the ramps. 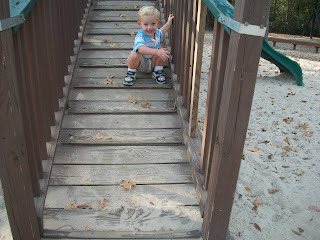 Brady was amused with all the bumps on the ramp. Peeking out the window of "Brady's house." Dawson at one of the houses pretending to serve me some food. Brady on the motorcycle - he loved it! This old boat in the sandpit was particularly enjoyable on this trip. 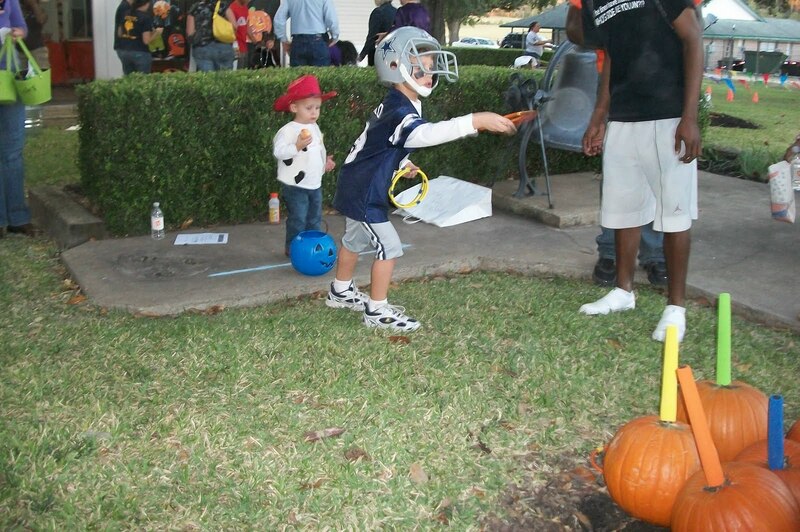 I love this picture - Dawson looking out for pirates and Brady just smiling and happy. 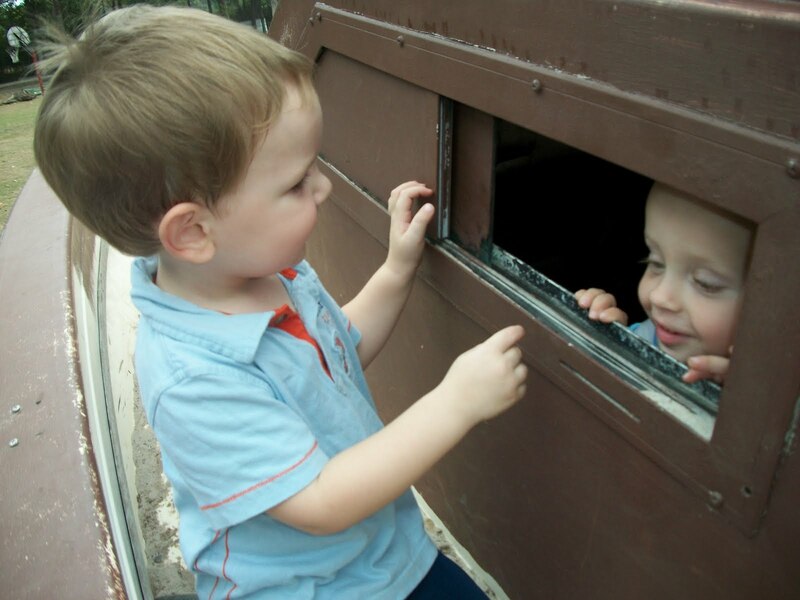 Wesley and Brady had so much fun opening and closing this window and looking in/out at each other. 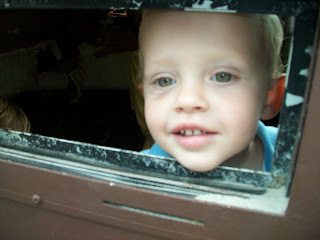 Sweet Brady in the window.